Gambling, Drug Running…Is This Guy Good AT Anything? If you’re going to transport a big ‘ol bag of drugs across Canada, maybe don’t listen to your buddy’s GPS when it tells you to unnecessarily cross the border into the United States. But if you are going to listen to it because it promises to save you some time, at least make sure everyone has all of their paperwork with them, for christ’s sake. The aforementioned big ‘ol bag of drugs. According to a criminal complaint filed in the eastern district of Michigan, Xethalis was told to transport “something” from Montreal to Calgary as a way of waiving a $2,000 gambling debt. He was also told to pick up two people in Toronto for the trip. Xethalis allegedly told investigators he knew he was transporting pills to Calgary, but didn’t know what they were. The complaint also indicates that once Xethalis picked up the two other passengers, one of them used his iPhone’s GPS to direct them to Calgary, which then led them to the Blue Water Bridge. 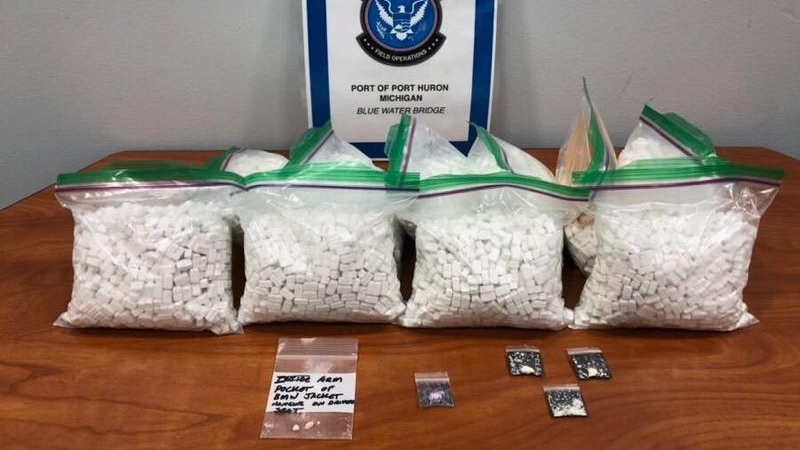 After approaching the border, none of the passengers could provide border agents with identification, so the agents conducted a secondary search of the vehicle, where the methamphetamine tablets were found. Xethalis has been charged with possession with intent to distribute controlled substances and importation of a schedule I controlled substance. “• If you are not handicapped, do not park in a handicap spot, especially if the sheriff’s personal vehicle is parked directly behind you. “• When a deputy tells you to move your vehicle because you are illegally parked in a handicap spot, do not exit the vehicle and run away. “• Do not jump into someone else’s vehicle and tell them you have warrants and need a ride-that person will probably tell on you. Good advice that unfortunately came too late for Kimberly and Anthony Twyman, who have been arrested and jailed for inspiring it. A man chased by Cape Coral police last week was found in his home Monday because he left his driver’s license with an officer. 30-year-old Vincent Parlato’s Ford Mustang was stopped on Santa Barbara Boulevard on Sunday, Feb. 10 after a Cape Coral police officer noticed him driving 60 mph in a 45 mph zone. Officer Ross pulled Parlato over. When explaining why she had stopped him, the officer said Parlato was argumentative and would not follow directions. He handed the officer his driver’s license and then decided to take off. To his credit, Parlato must have done a decent job of taking off. It took police a week to catch up with him. But when they did, he was promptly charged with fleeing and eluding law enforcement and resisting law enforcement without violence. This is definitely one of the dumber thefts I’ve seen in a while. So what if I had to show ID to get in and who cares if there’s quite obviously a camera attached to this house? I’m taking this package. Just try to stop me. Surveillance cameras captured a delivery driver taking an Amazon package she had just dropped off at a Parkland home. The reported theft took place along the 9900 block of Northwest 66th Manor in the gated community, Monday afternoon. The video showed an Amazon contractor dropping off and taking a picture of the package at the home’s front porch. The woman could then be seen in the video picking up the package before walking away with it. Amazon has taken the driver off her route while the investigation is ongoing. The value of the items taken was approximately $7, so hopefully it was all worth it. If you somehow have any information that may be helpful, you can call Broward County Crime Stoppers at 954-493-TIPS. You may be eligible for a $3,000 reward, which is pretty hilarious. How long until the delivery lady calls in to confess, then tries to sue when she doesn’t get paid for solving the crime? If you’re going to rob a hotel, maybe don’t use its own sheets as your disguise. And maybe don’t book a room there under your own name. And hiding in that room after the fact and expecting not to be discovered? You should maybe forget about that, too. Joseph Elder, 59, of Wayne, New Jersey, got into the lobby of the Ramada Inn on Route 46 through a now-shuttered adjacent restaurant wearing the sheet around 11:30 p.m. on Dec. 29, the Wayne Police Department said. After Elder entered the lobby, he allegedly jumped over the hotel desk counter, pried open a cash drawer and stole an unspecified amount of money before fleeing through the restaurant, police said. “… [Elder] attempted to conceal his identity with a Casper the ghost style bed sheet with holes cut out,” the department said. Officers searching the area after the robbery learned that Elder was actually staying in a room at the hotel, according to police. He’s been charged with a count each of burglary and theft. Get The Door. It’s A Robbery! Get The Door. It’s A Robbery! Now here’s something you don’t see every day. An unintentional simultaneous robbery. The clip, shot inside the takeaway restaurant in Rotterdam, Netherlands, shows employees winding down to close the shop after a long day when an armed man bursts through the door. Demanding a lone worker return to the office and retrieve cash, he clearly brandishes a weapon before the pair disappear away from sight of the camera positioned at the front of the shop. But while they are in the back, another pair of criminals suddenly charge through the door and leap over the counter wearing masks. Dutch media outlet Metro Nieuws reports that the two men then forced the first intruder to the ground “giving him a slap” before making off with stacks of money from inside the safe. They can then be seen escaping from the restaurant with bundles of cash – before the first assailant follows seconds later, dropping a few notes as he scarpers out of the front door. You know, I could really use a new bike. But man, they sure are pricey. Maybe I’d be better off stealing one. Like that one over there by the police station. It looks nice. Suspect arrested for attempting to steal a bike…From the PD!!!! SGT Okerman arrested the suspect after confronting him with a Taser. Video of the encounter below. A man was arrested last week after allegedly trying to steal a bicycle from in front of the Gladstone Police Department in Oregon. Cops posted surveillance footage of the apparent theft attempt. An individual wearing a dark colored hoodie and apparent face covering walked up to the station with what seemed to be bolt cutters. He began working on it, but not even a minute passed before a cop stepped outside and confronted him. The officer ordered him against the wall, pulled out a taser, commanded him to get on the ground, and handcuffed the individual. A female cop later ran out to assist the arrest. The two were then joined by a male officer. The time stamp is dated Thursday, just before 6:30 p.m.
Adam Valle, 26, has been charged with theft, criminal mischief, and felon in possession of a weapon. After police confronted him because it seemed an awful lot like he was about to leave a Walmart without paying for $125 worth of stuff that he had stashed in a backpack, 24-year-old Jeremy Roberts proved them right, taking off running instead of hanging around for a chat. A shot from a Taser didn’t slow him down, but thankfully police had some help on that front in the form of Roberts himself. While fleeing, Roberts decided to duck into a nearby building in an attempt to lose his pursuers. The building he picked to hide in? CPD District 3’s station. Upon Roberts arrival, he was greeted by “numerous” officers who quickly placed him in custody. Roberts is charged with Theft and Obstructing Official Business. Police are calling his escape route a “tactical error.” That’s your understatement of the week so far. Is there a definition of obstruction I’m unaware of? block (an opening, path, road, etc. ); be or get in the way of. prevent or hinder (movement or someone or something in motion). Seems to me they should be charging him with assisting. For all of the careful planning that can sometimes go into them, prison escapes themselves are necessarily a pretty rushed act. So although you almost can’t fault Allen Lewis for the way his turned out, he’s still worth pointing and laughing at because come on, man. Allen Lewis, 31, had run away when being moved from Greenup County Detention Center in Kentucky, to face charges in a different county. Lewis complained to the transport officer that his handcuffs hurt, so the officer pulled over to fix them. When one cuff was released, a struggle ensued and Lewis fled on foot. While the prison mounted a search operation, the escapee made it to a nearby highway and tried to flag down a lift. Unfortunately for him, the person who stopped was a campus police officer at the local Morehead State University. The handcuffs dangling from one of Lewis’s wrists proved a rather obvious giveaway. He’s now facing an escape charge along with the rest of his troubles.